Are you better off than eight years ago? It's easier to find a good job. I'm making more money. I'm more optimistic about the future. That's how many Americans feel about their personal financial situations since President Obama took office eight years ago. Voters are certainly hearing a lot about the economy in this presidential election, though it can seem like we are living in two different Americas depending on which candidate is talking. Regardless of what's said on the campaign trail, though, many Americans report they are feeling flusher than they did several years ago. 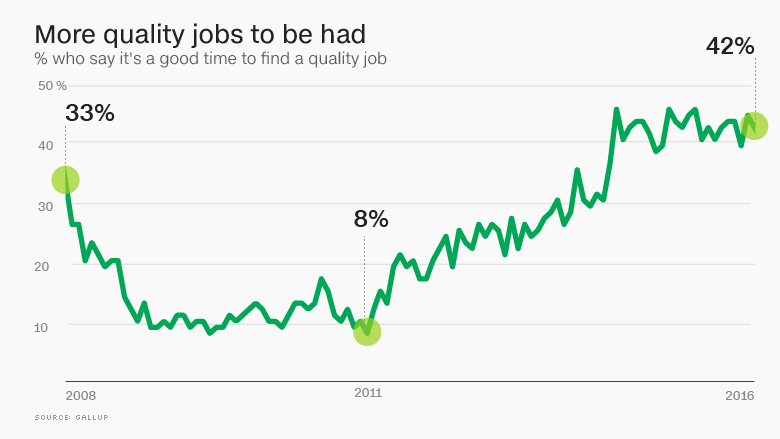 Some 42% of Americans say now is a good time to find a quality job, according to an October Gallup poll. This is a vast improvement from 2011, when it hit a low of 8%. The measure is now just below where it was in the boom times of 2007. 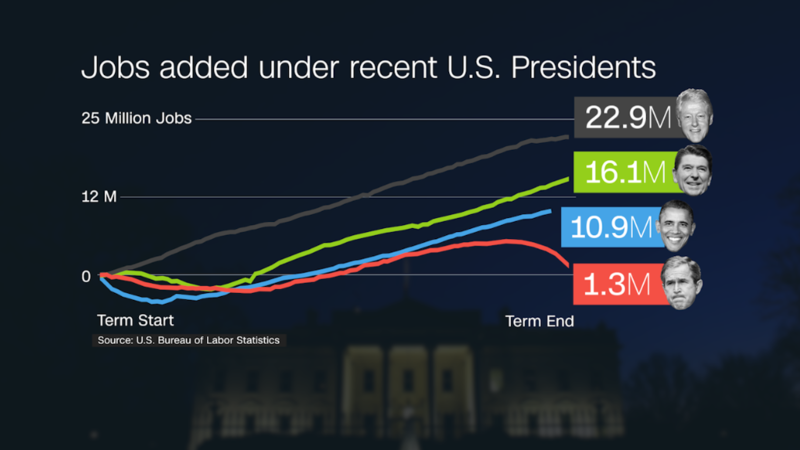 These sentiments are in line with an upward swing in the job market -- unemployment fell to 4.9% in October, compared to 7.8% when President Obama took office in January, 2009. A total of 10.9 million jobs have been created during his tenure. So while the economy still ranks as voters' top concern, unemployment has fallen to 7th place, with just 6% citing it as the nation's number one problem, down from a high of 39% in the fall of 2011. Several Gallup reports point to Americans' improving attitudes about their finances and the economy. Consumer confidence, investor optimism and small business owner confidence have all improved since Obama took office in 2008, said Frank Newport, Gallup's editor-in-chief. "Americans are overwhelmingly better off than they were eight years ago," Newport said. "There's no question about it." Of course, the nation was in the midst of a major recession when people went to the polls in 2008, and it was still healing during the 2012 election. Most of Gallup's measures have climbed since then, though they have leveled over the past year or two, Newport said. Related: Clinton vs. Trump: Who's better for stocks and jobs? The economic recovery has put many Americans in a better place. 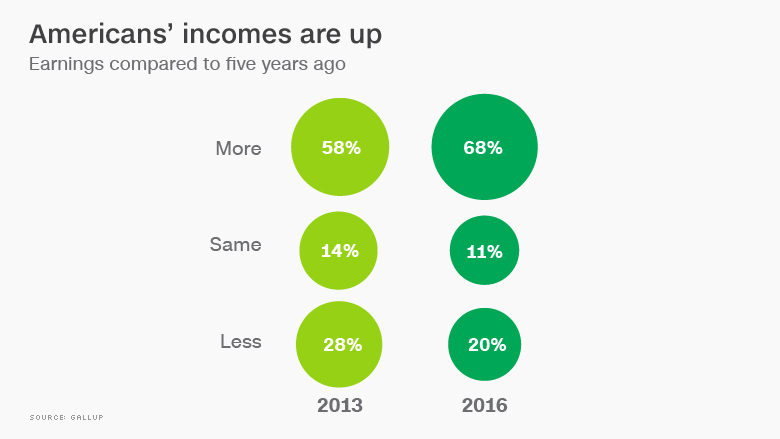 More than two-thirds say they are making more than they were five years ago and only 20% say they are making less, according to an August poll from Gallup. In 2013, only 58% said they were earning more, and 28% said they were bringing home less. Median household income had remained fairly flat until 2015, when it jumped 5.2% to $56,516. It marked the first increase in median income since 2007, the year before the Great Recession started. Workers are also pretty pleased with their jobs, with few saying they feel underemployed. Some 70% said their job is a good match for their skills and training, while only 23% said their position doesn't take advantage of their abilities and knowledge. More Americans are reporting that they are better off now than they were a year ago, compared to those who felt this way in 2013, according to the New York Federal Reserve's Survey of Consumer Expectations. More also have a positive attitude about the coming year. The stock market has also soared in recent years, with the S&P 500 Index now above 2100, after plummeting to 735 in February 2009. This has revived many Americans' fortunes. Take Ken Dukes, 57. In 2008 and 2009, the freelance computer programmer saw his investments shrink by 50%. But he didn't panic and sell. Instead, he added to his portfolio, which he says has more than doubled since then. The strong market recovery allowed the Kissimmee, Florida, resident to retire two years ago. 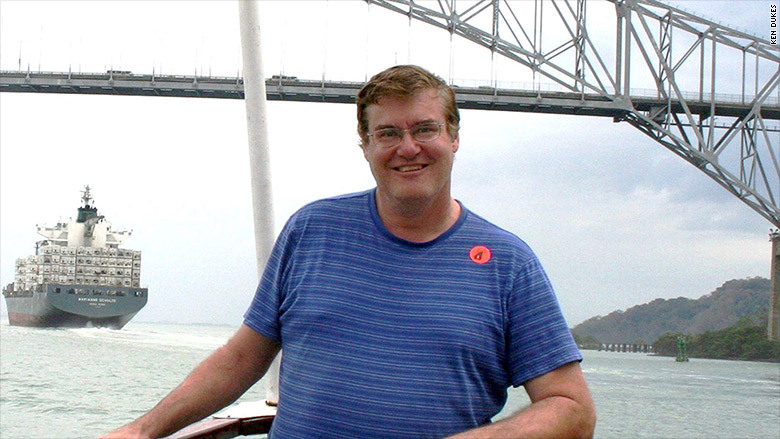 He now devotes himself to teaching Sunday school and hobbies, such as programming video games. "It's nice that my investments and retirement savings are doing well enough so I can retire and do the things I want to do," Dukes said.